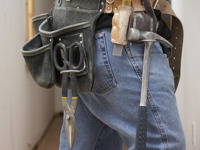 Are you considering a home remodeling project for your property? Most remodeling projects involve either structural or aesthetic aspects which might require several specialized technical skills. If this is the case, you may want to enlist the services of a general contractor. A general contractor negotiates a contract for the entire remodeling project, and either completes the specialized work with his own crew, or sub-contracts to other various house remodeling contractors. Some of the specialized areas might include planning/architecture, concrete, plumbing, electrical, roofing, dry wall, cabinetry, or painting. To get an accurate bid from a potential general contractor, it is very important to plan carefully, with much thought and consideration. You may want to involve an architect or draftsman to generate the blueprints for your project. Remember that any home remodeling features not included in the plans will not be included in the bid. Once you have detailed plans for your project, you need to start the selection process for a general contractor. Canadian residents can go on-line to for a list of qualified, licensed contractors. It is a rule of thumb to get at least 3 bids from separate remodeling contractors. Provide each with an identical set of plans. Be upfront about your expectations, and request they be realistic about time, cost, and interruption factors. It is wise not to make a selection based on price alone; other considerations are equally important. Before you accept a bid from a contractor ask questions: What experience and references do they have from projects similar to yours? Will they be working on other projects simultaneously with your own? If they will not be personally working at your site, how much time each day will they spend supervising? Will they use their own crew for some or all the work? How available will any sub-contractors be? What licenses and insurance do they carry? And what is the time line of the project, start to finish? These are questions any reliable, qualified general contractor should answer and outline in the contract. When negotiating the contract for your home remodeling project, be thorough and accurate. Include complete names and addresses of both parties, a detailed job description, material specifications, start and finish dates, any warranties on work or materials, and payment options.It is fairly common for a general contractor to ask for 10-33% of the estimated cost in advance; most contracts provide for payment as work progresses.A reliable, reputable contractor will agree to contract terms which help protect the interests of both parties.